On 19 January 1942, US President Franklin D. Roosevelt approved the production of an atomic bomb. At that time, most of the technology for producing an atomic bomb still needed to be developed and the US had very little infrastructure in place to support that work. The Manhattan Engineer District (MED, aka the “Manhattan Project”) was responsible for the research, design, construction and operation of the early US nuclear weapons complex and for delivering atomic bombs to the US Army during World War II (WW II) and in the immediate post-war period. The Manhattan Project existed for just five years. In 1943, 75 years ago, the Manhattan Project transitioned from planning to construction and initial operation of the first US nuclear weapons complex facilities. 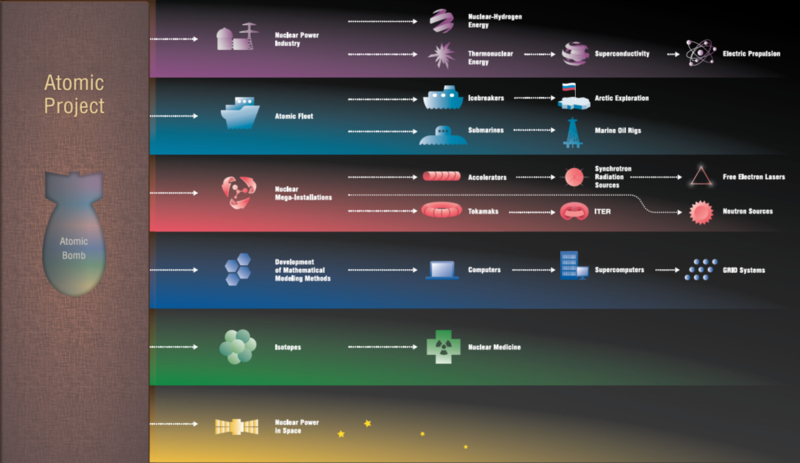 Here’s a very brief timeline for the Manhattan Project. 13 August 1942: The Manhattan Engineer District was formally created under the leadership of U.S. Army Colonel Leslie R. Groves. 2 December 1942: A team led by Enrico Fermi achieved the world’s first self-sustaining nuclear chain reaction in a graphite-moderated, natural uranium fueled reactor known simply as Chicago Pile-1 (CP-1). 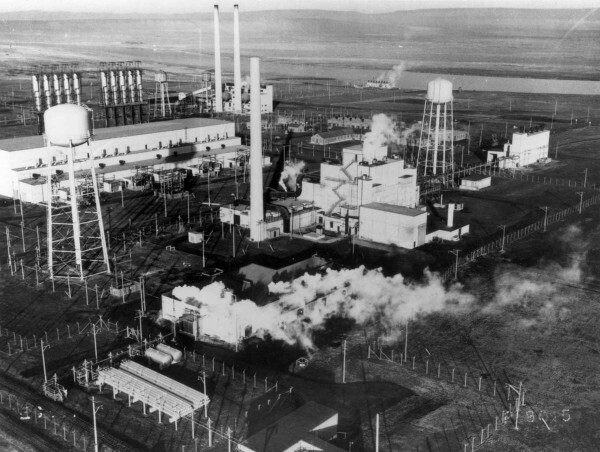 1943 – 1946: The Manhattan Project managed the construction and operation of the entire US nuclear weapons complex. 16 July 1945: The first nuclear device was successfully tested at the Trinity site near Alamogordo, NM, less than three years after the Manhattan Project was created. 6 & 9 August 1945: Atomic bombs were employed by the US against Japan, contributing to ending World War II. 1 January 1947: The newly formed, civilian-led Atomic Energy Commission (AEC) took over management and operation of all research and production facilities from the Manhattan Engineer District. 25 August 1947: The Manhattan Engineer District was abolished. The WW II nuclear weapons complex was the foundation for the early US post-war nuclear weapons infrastructure that evolved significantly over time to support the US mutually-assured destruction strategy during the Cold War with the Soviet Union. Today, the US nuclear weapons complex continues to evolve as needed to perform its critical role in maintaining the US nuclear deterrent capability. On 10 November 2015, a memorandum of agreement between DOE and the National Park Service (NPS) established the park and the respective roles of DOE and NPS in managing the park and protecting and presenting certain historic structures to the public. Following is a brief overview of the three sites that currently comprise the Manhattan Project National Historical Park. 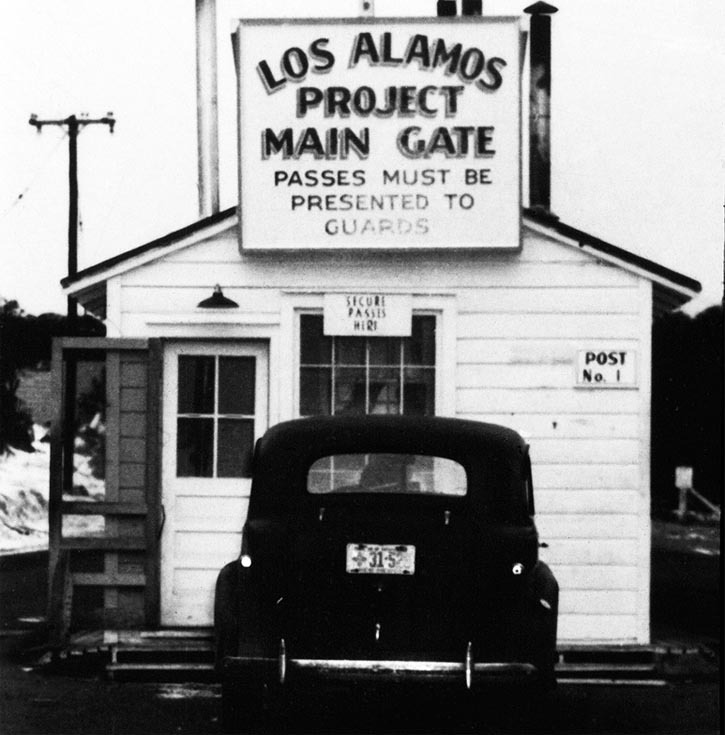 Los Alamos Laboratory was established 75 years ago, in early 1943, as MED Site Y, under the direction of J. Robert Oppenheimer. This was the Manhattan Project’s nuclear weapons laboratory, which was created to consolidate in one secure, remote location most of the research, design, development and production work associated producing usable nuclear weapons to the US Army during WW II. One uranium-fueled, gun-type atomic bomb code named “Little Boy” was produced. This was the atomic bomb dropped on Hiroshima, Japan on 6 August 1945, making it the first nuclear weapon used in warfare. This atomic bomb design was not tested before it was used operationally. Two plutonium-fueled, implosion-type atomic bombs code named “Fat Man” were produced. These bombs were very similar to Gadget. One of the Fat Man bombs was dropped on Nagasaki, Japan on 9 August 1945. The second Fat Man bomb could have been used during WW II, but it was not needed after Japan announced its surrender on 15 August 1945. The highly-enriched uranium for the Little Boy bomb was produced by the enrichment plants at Oak Ridge. The plutonium for Gadget and the two Fat Man bombs was produced by the production reactors at Hanford. Gun Site Facilities: three bunkered buildings (TA-8-1, TA-8-2, and TA-8-3), and a portable guard shack (TA-8-172). Pajarito Site: TA-18-1 Slotin Building, TA-8-2 Battleship Control Building, and the TA-18-29 Pond Cabin. Liquid thermal diffusion process, based on work by Philip Abelson at Naval Research Laboratory and the Philadelphia Naval Yard. This process was implemented at S-50, which produced uranium enriched to < 2 at. % U-235. Gaseous diffusion process, based on work by Harold Urey at Columbia University. This process was implemented at K-25, which produced uranium enriched to about 23 at. % U-235 during WW II. 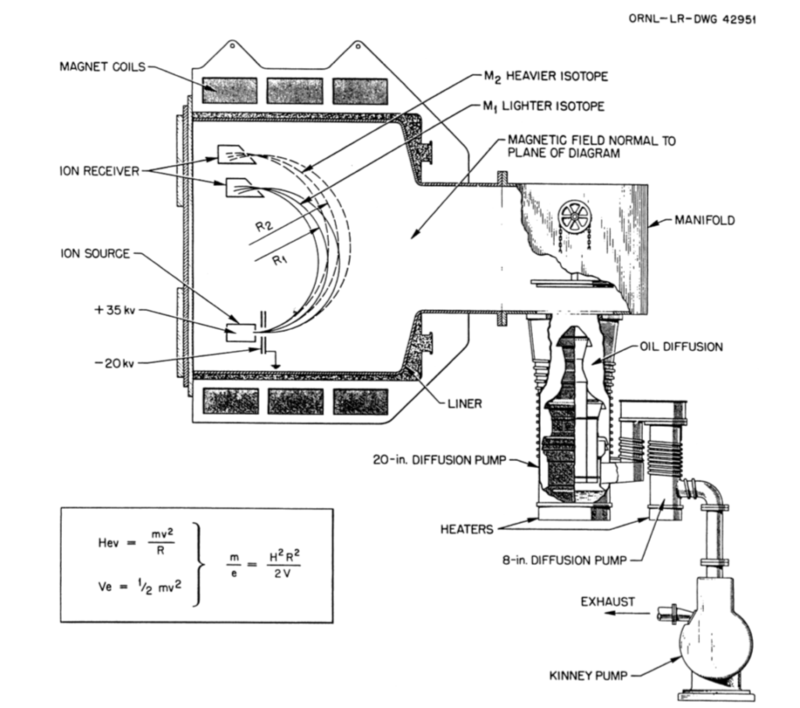 Electromagnetic separation process, based on Ernest Lawrence’s invention of the cyclotron at the University of California Berkeley in the early 1930s. This process was implemented at Y-12 where the final output was weapons-grade uranium. The Little Boy atomic bomb used 92.6 pounds (42 kg) of highly enriched uranium produced at Oak Ridge with contributions from all three of these processes. The nearby township was named Oak Ridge in 1943, but the nuclear site itself was not officially renamed Oak Ridge until 1947. The S-50 Thermal Diffusion Plant was dismantled in the late 1940s. This site is not part of the Manhattan Project National Historical Park. X-10 was the world’s second nuclear reactor (after the Chicago Pile, CP-1) and the first reactor designed and built for continuous operation. It was intended to produce the first significant quantities of plutonium, which were used by scientists at Los Alamos to characterize plutonium and develop the design of a plutonium-fueled atomic bomb. X-10 was a large graphite-moderated, natural uranium fueled reactor that originally had an continuous design power rating of 1.0 MWt, which later was raised to 3.5 MWt. Originally, it was intended to be a prototype for the much larger plutonium production reactors being planned for Hanford. 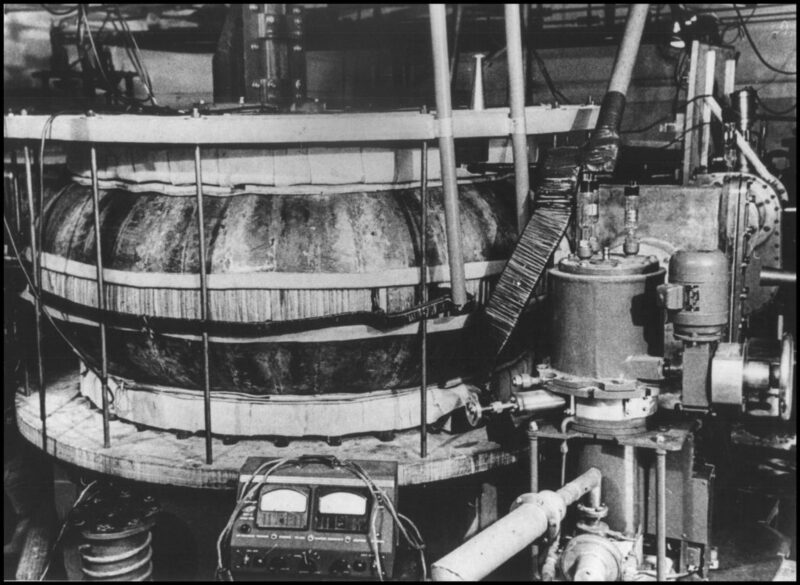 The selection of air cooling for X-10 enabled this reactor to be deployed more rapidly, but limited its value as a prototype for the future water-cooled plutonium production reactors. 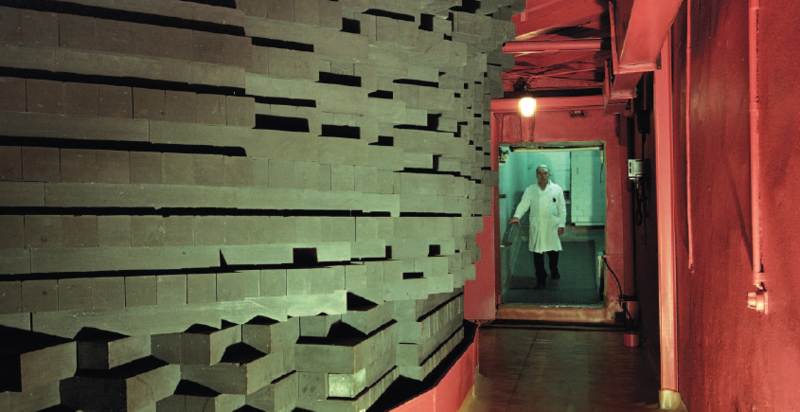 The X-10 reactor core was comprised of graphite blocks arranged into a cube measuring 24 feet (7.3 meters) on each side. 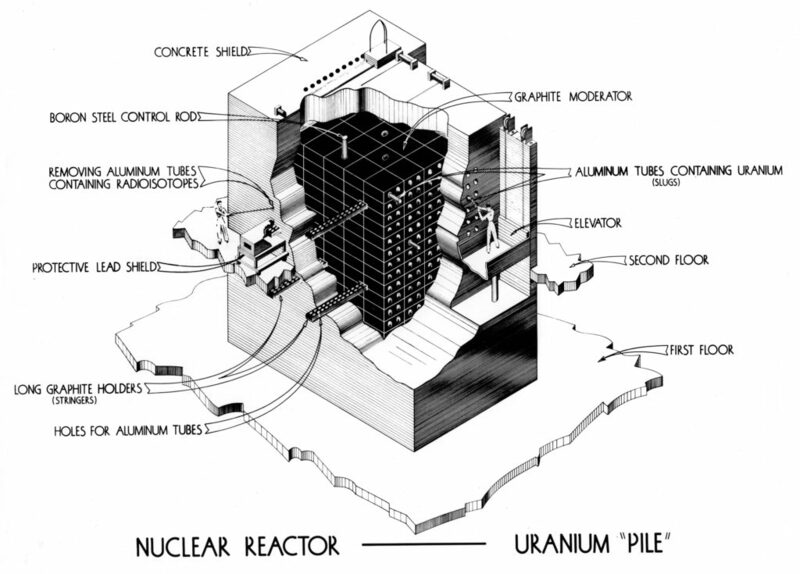 The core was surrounded by several feet of high-density concrete and other material to provide radiation shielding. The core and shielding were penetrated by 1,248 horizontal channels arranged in 36 rows. Each channel served to position up to 54 fuel slugs in the core and provide passages for forced air cooling of the core. Each fuel slug was an aluminum clad, metallic natural uranium cylinder measuring 4 inches (10.16 cm) long x 1.1 inches (2.79 cm) in diameter. New fuel slugs were added manually at the front face (the loading face) of the reactor and irradiated slugs were pushed out through the back face of the reactor, dropping into a cooling water pool. 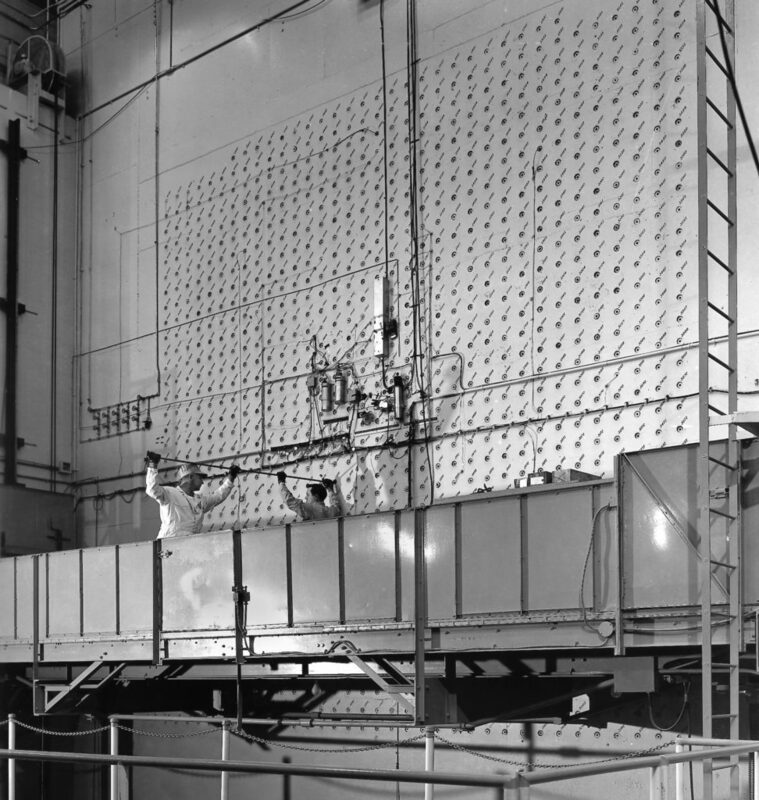 The reactor was controlled by a set of vertical control rods. 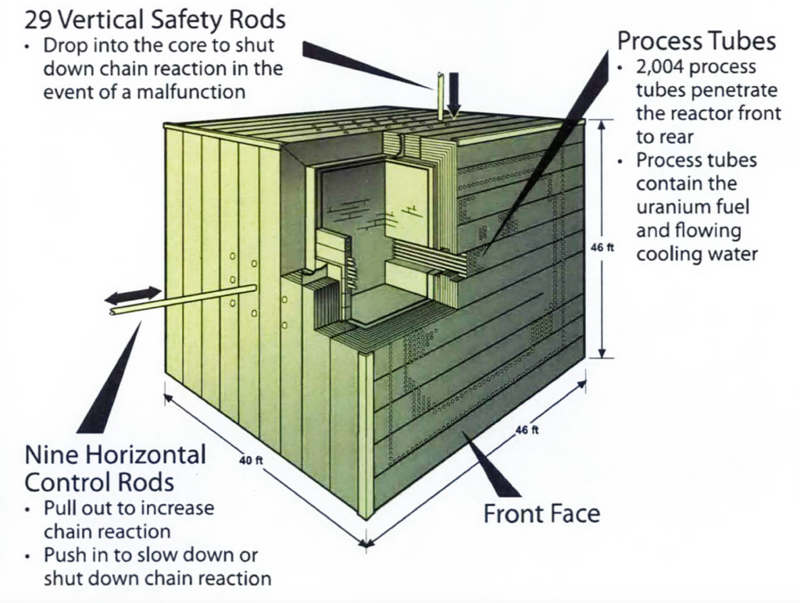 The basic geometry of the X-10 reactor is shown below. Site construction work started 75 years ago, on 27 April 1943. Initial criticality occurred less than seven months later, on 4 November 1943. Plutonium was recovered from irradiated fuel slugs in a pilot-scale chemical separation line at Oak Ridge using the bismuth phosphate process. In April 1944, the first sample (grams) of reactor-bred plutonium from X-10 was delivered to Los Alamos. Analysis of this sample led Los Alamos scientists to eliminate one candidate plutonium bomb design (the “Thin Man” gun-type device) and focus their attention on the Fat Man implosion-type device. X-10 operated as a plutonium production reactor until January 1945, when it was turned over to research activities. X-10 was permanently shutdown on 4 November 1963, and was designated a National Historic Landmark on 15 October 1966. Preliminary site work for the K-25 gaseous diffusion plant began 75 years ago, in May 1943, with work on the main building starting in October 1943. The six-stage pilot plant was ready for operation on 17 April 1944. The K-25 gaseous diffusion plant feed material was uranium hexafluoride gas (UF6) from natural uranium and slightly enriched uranium from both the S-50 liquid thermal diffusion plant and the first (Alpha) stage of the Y-12 electromagnetic separation plant. During WW II, the K-25 plant was capable of producing uranium enriched up to about 23 at. % U-235. This product became feed material for the second (Beta) stage of the Y-12 electromagnetic separation process, which continued the enrichment process and produced weapons-grade U-235. As experience with the gaseous diffusion process improved and additional cascades were added, K-25 became capable of delivering highly-enriched uranium after WW II. Construction on the second Oak Ridge gaseous diffusion plant, K-27, began on 3 April 1945. This plant became operational after WW II. 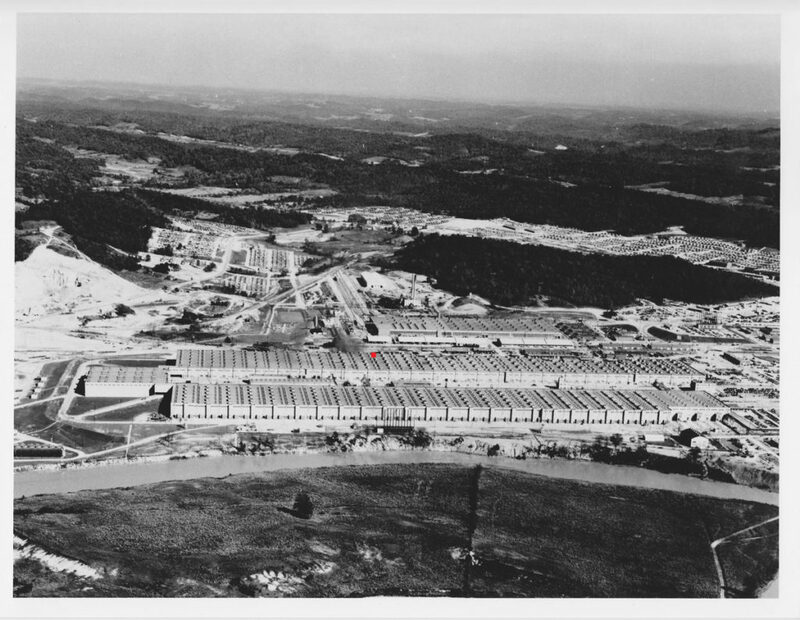 By 1955, the K-25 complex had grown to include gaseous diffusion buildings K-25, K-27, K-29, K-31 and K-33 that comprised a multi-building, enriched uranium production chain collectively known as the Oak Ridge Gaseous Diffusion Plant (ORGDP). Operation of the ORGDP continued until 1985. Additional post-war gaseous diffusion plants based on the technology developed at Oak Ridge were built and operated in Paducah, KY (1952 – 2013) and Portsmouth, OH (1954 – 2001). In 1941, Earnest Lawrence modified the 37-inch (94 cm) cyclotron in his laboratory at the University of California Berkeley to demonstrate the feasibility of electromagnetic separation of uranium isotopes using the same principle as a mass spectrograph. The initial industrial-scale design agreed in 1942 was called an Alpha (α) calutron, which was designed to enrich natural uranium (@ 0.711 at.% U-235) to >10 at.% U-235. The later Beta (β) calutron was designed to further enrich the output of the Alpha calutrons, as well as the outputs from the K-25 and S-50 processes, and produce weapons-grade uranium at >88 at.% U-235. 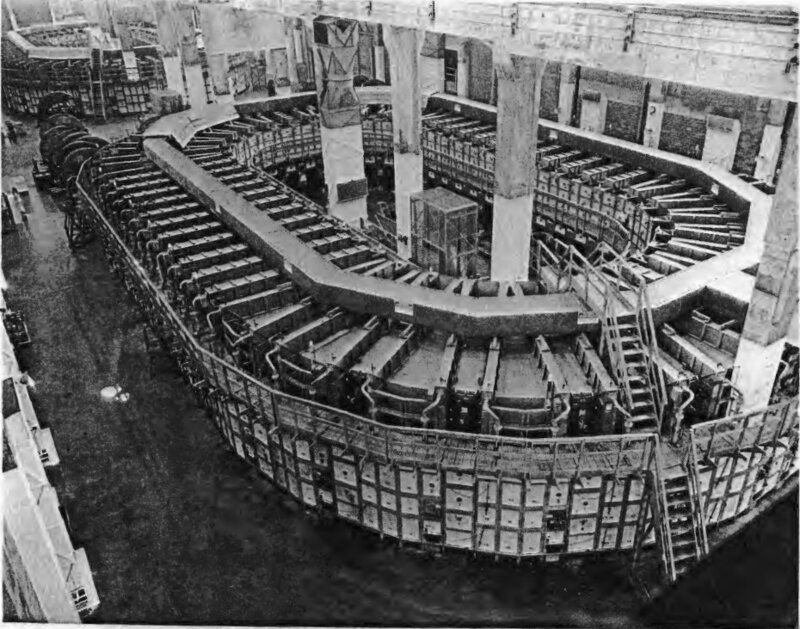 The calutrons required large magnet coils to establish the strong electromagnetic field needed to separate the uranium isotopes U-235 and U-238. 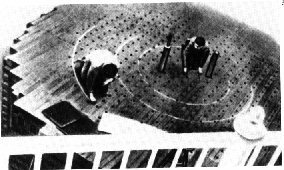 The shape of the magnet coils for both the Alfa and Beta calutrons resembled a racetrack, with many individual calutron modules (aka “tanks”) arranged side-by-side around the racetrack. At Y-12, there were nine Alpha calutron “tracks” (5 x Alpha-1 and 4 x Alpha-2 tracks), each with 96 calutron modules (tanks), for a total of 864 Alpha calutrons. In addition, there were eight Beta calutron tracks, each with 36 calutron modules, for a total of 288 beta calutrons, only 216 of which ever operated. Due to wartime shortages of copper, the Manhattan Project arranged a loan from the Treasury Department of about 300 million Troy ounces (10,286 US tons) of silver for use in manufacturing the calutron magnet coils. A general arrangement of a Beta calutron module (tank) is shown in the following diagram, which also shows the isotope flight paths from the uranium tetrachloride (UCl4) ion source to the ion receivers. Separated uranium was recovered by burning the graphite ion receivers and extracting the metallic uranium from the ash. Construction of Buildings 9731 and 9204-3 at the Y-12 complex began 75 years ago, in February 1943. By February 1944, initial operation of the Alpha calutrons had produced only 0.44 pounds (0.2 kg) of U-235 @ 12 at.%. By August 1945, the Y-12 Beta calutrons had produced the 92.6 pounds (42 kg) of weapons-grade uranium needed for the Little Boy atomic bomb. After WW II, the silver was recovered from the calutron magnet coils and returned to the Treasury Department. On January 16, 1943, General Leslie Groves officially endorsed Hanford as the proposed plutonium production site, which was given the MED code name Site W. The plan was to construct three large graphite-moderated, water-cooled plutonium production reactors, designated B, D, and F, in along the Columbia River. The Hanford site also would include a facility for manufacturing the new uranium fuel slugs for the reactors as well as chemical separation plants and associated facilities to recover and process plutonium from the irradiated uranium slugs. After WW II, six more plutonium production reactors were built at Hanford along with additional plutonium and nuclear waste processing and storage facilities. The B Reactor at the Hanford Site was the world’s first full-scale reactor and the first of three plutonium production reactor of the same design that became operational at Hanford during WW II. 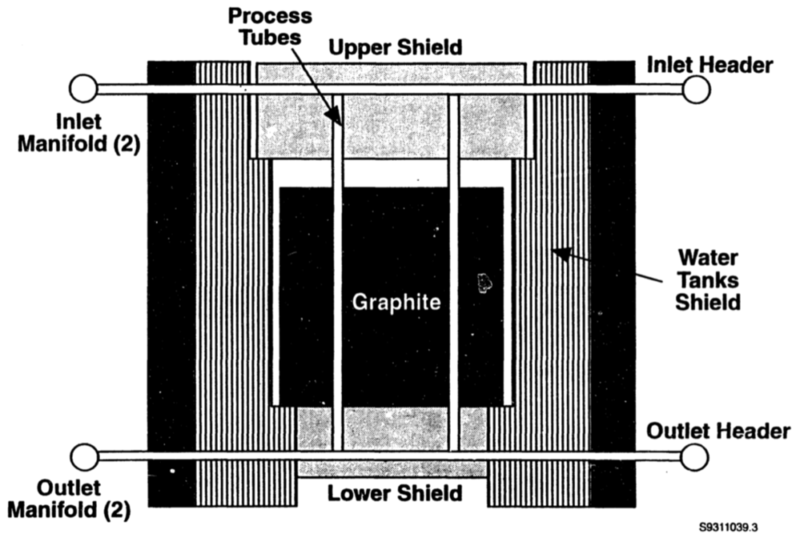 B Reactor and the similar D and F Reactors were significantly larger graphite-moderated reactor than the X-10 Graphite Reactor at Oak Ridge. The rectangular reactor core measured 36 feet (11 m) wide x 36 feet (11 m) tall x 28 feet (8.53 m) deep, surrounded by radiation shielding. These reactors were fueled by aluminum clad, metallic natural fuel slugs measuring 8 inches (20.3 cm) long x 1.5 inches (3.8 cm) in diameter. As with the X-10 Graphite Reactor, new fuel slugs were inserted into process tubes (fuel channels) at the front face of the reactor. 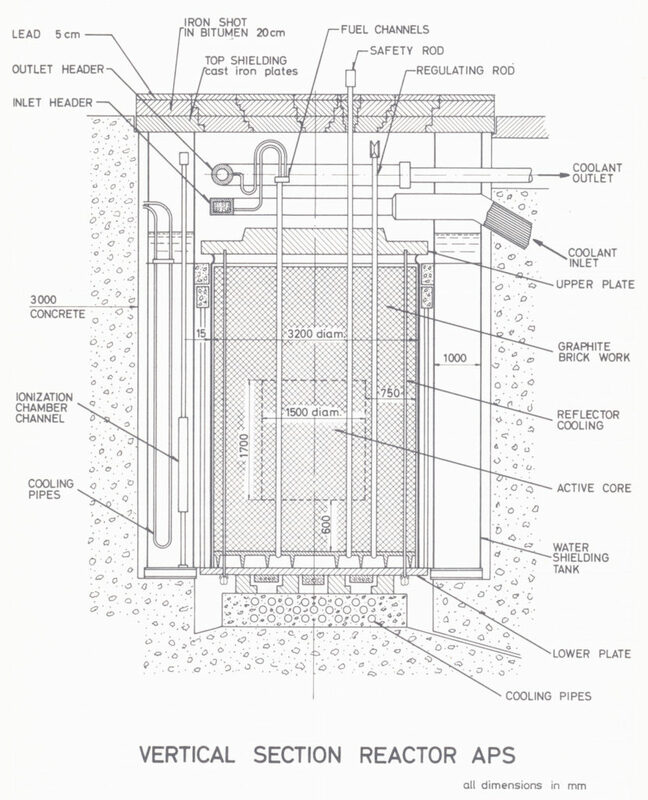 The irradiated fuel slugs were pushed out of the fuel channels at the back face of the reactor, falling into a water pool to allow the slugs to cool before further processing for plutonium recovery. Reactor cooling was provided by the once-through flow of filtered and processed fresh water drawn from the Columbia River. The heated water was discharged from the reactor into large retention basins that allowed some cooling time before the water was returned to the Columbia River. Construction of B Reactor began 75 years ago, in October 1943, and fuel loading started 11 months later, on September 13, 1944. Initial criticality occurred on 26 September 1944, followed shortly by operation at the initial design power of 250 MWt. B Reactor was the first reactor to experience the effects of xenon poisoning due to the accumulation of Xenon (Xe-135) in the uranium fuel. Xe-135 is a decay product of the relatively short-lived (6.7 hour half-life) fission product iodine I-135. With its very high neutron cross-section, Xe-135 absorbed sufficient neutrons to significantly, and unexpectedly, reduce B Reactor power. Fortunately, DuPont had added more process tubes (a total of 2004) than called for in the original design of B Reactor. After the xenon poisoning problem was understood, additional fuel was loaded, providing the core with enough excess reactivity to override the neutron poisoning effects of Xe-135. On 3 February 1945, the first batch of B Reactor plutonium was delivered to Los Alamos, just 10 months after the first small plutonium sample from the X-10 Graphite Reactor had been delivered. Regular plutonium deliveries from the Hanford production reactors provided the plutonium needed for the first ever nuclear device (the Gadget) tested at the Trinity site near Alamogordo, NM on 16 July 1945, as well as for the Fat Man atomic bomb dropped on Nagasaki, Japan on 9 August 1945 and an unused second Fat Man atomic bomb. These three devices each contained about 13.7 pounds (6.2 kilograms) of weapons-grade plutonium produced in the Hanford production reactors. 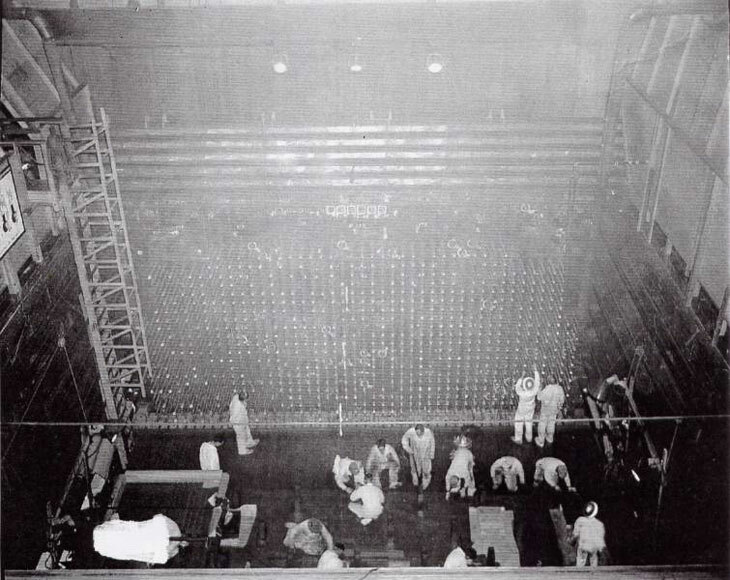 From March 1946 to June 1948, B Reactor was shut down for maintenance and modifications. In March 1949, B Reactor began the first tritium production campaign, irradiating targets containing lithium and producing tritium for hydrogen bombs. By 1963, B Reactor was permitted to operate at a maximum power level of 2,090 MWt. B Reactor continued operation until 29 January 1968, when it was ordered shut down by the Atomic Energy Commission. Because of its historical significance, B Reactor was given special status that allows it to be open for public tours as part of the Manhattan Project National Historical Park. During WW II, three plutonium reactors of the same design were operational at Hanford: B, D and F. All had an initial design power rating of 250 MWt and by 1963 all were permitted to operate at a maximum power level of 2,090 MWt. D Reactor: This was the world’s second full-scale nuclear reactor. It became operational in December 1944, but experienced operational problems early in life due to growth and distortion of its graphite core. After developing a process for controlling graphite distortion, D Reactor operated successfully through June 1967. F Reactor: This was the third of the original three production reactors at Hanford. It became operational in February 1945 and ran for more than twenty years until it was shut down in June1965. D and F Reactors currently are in “interim safe storage,” which commonly is referred to as “cocooned.” These reactor sites are not part of the Manhattan Project National Historical Park. After WW II, six additional plutonium production reactors were built and operated at Hanford. The first three, named H, DR and C, were very similar in design to the B, D and F Reactors. The next two, K-West and K-East, were of similar design, but significantly larger than their predecessors. The last reactor, named N, was a one-of-a kind design. H Reactor: This was the first plutonium production reactor built at Hanford after WW II. It became operational in October 1949 with a design power rating of 400 MWt and by 1963 was permitted to operate at a maximum power level of 2,090 MWt. It operated for 15 years before being permanently shut down in April 1965. DR Reactor: This reactor originally was planned as a replacement for the D Reactor and was built adjacent to the D Reactor site. DR became operational in October 1950 with an initial design power rating of 250 MWt. It operated in parallel with D Reactor for 14 years, and by 1963 was permitted to operate at the same maximum power level of 2,090 MWt. DR was permanently shut down in December 1964. C Reactor: Reactor construction started June 1951 and it was completed in November 1952, operating initially at a design power of 650 MWt. By 1963, C Reactor was permitted to operate at a maximum power level of 2,310 MWt. It operated for sixteen years before being shut down in April 1969. C Reactor was the first reactor at Hanford to be placed in interim safe storage, in 1998. K-West & K-East Reactors: These larger reactors differed from their predecessors mainly in the size of the moderator stack, the number, size and type of process tubes (3,220 process tubes), the type of shielding and other materials employed, and the addition of a process heat recovery system to heat the facilities. These reactors were built side-by-side and became operational within four months of each other in 1955: K-West in January and K-East in April. These reactors initially had a design power of 1,800 MWt and by 1963 were permitted to operate at a maximum power level of 4,400 MWt before an administrative limit of 4,000 MWt was imposed by the Atomic Energy Commission. The two reactors ran for more than 15 years. K-West was permanently shut down in February 1970 followed by K-East in January 1971. N Reactor: This was last of Hanford’s nine plutonium production reactors and the only one designed as a dual-purpose reactor capable of serving as a production reactor while also generating electric power for distribution to the external power grid. The N Reactor had a reactor design power rating of 4,000 MWt and was capable of generating 800 MWe. The N Reactor also was the only Hanford production reactor with a closed-loop primary cooling system. Plutonium production began in 1964, two years before the power generating part of the plant was completed in 1966. N Reactor operated for 24 years until 1987, when it was shutdown for routine maintenance. However, it never restarted, instead being placed in standby status by DOE and then later retired. Four of these reactors (H, DR, C and N) are in interim safe storage while the other two (K-West and K-East) are being prepared for interim safe storage. None of these reactor sites are part of the Manhattan Project National Historical Park. The Federation of American Scientists (FAS) reported that the nine Hanford production reactors produced 67.4 metric tons of plutonium, including 54.5 metric tons of weapons-grade plutonium, through 1987 when the last Hanford production reactor (N Reactor) was shutdown. 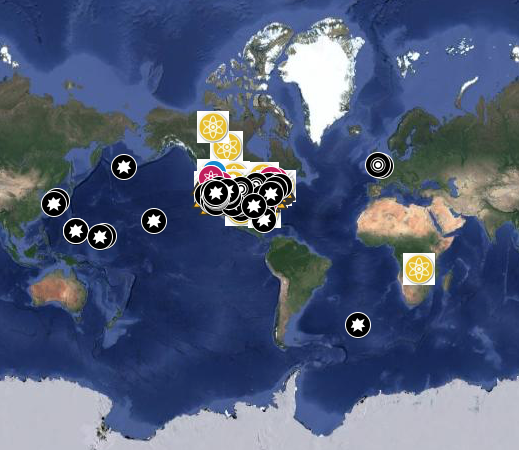 Another site worth browsing is the interactive world map created by the ALSOS Digital Library for Nuclear Issues on Google Maps to show the locations and provide information on offices, mines, mills, plants, laboratories, and test sites of the US nuclear weapons complex from World War II to 2016. The map includes over 300 sites, including the Manhattan Project sites. I think you’ll enjoy exploring this interactive map. Following is a list of other online resources where you can find additional information related to this post. The I. V. Kurchatov Institute of Atomic Energy in Moscow was founded 75 years ago, in 1943, and is named for its founder, Soviet nuclear physicist Igor Vasilyevich Kurchatov. Until 1955, the Institute was a secret organization known only as “Laboratory No. 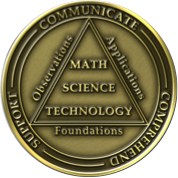 2 of the USSR Academy of Sciences.” The initial focus of the Institute was the development of nuclear weapons. 25 December 1946: USSR’s F-1 (Physics-1) reactor achieved initial criticality at Kurchatov Institute. This was the 1st reactor built and operated outside the US. 10 June 1948: USSR’s 1st plutonium production reactor achieved initial criticality (Unit A at Chelyabinak-65). 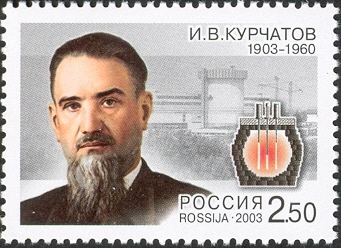 The reactor was designed under the leadership of N. A. Dollezhal. 29 August 1949: USSR’s 1st nuclear device, First Lightning [aka RDS-1, Izdeliye 501 (device 501) and Joe 1], was detonated at the Semipalatinsk test site in what is now Kazakhstan. This was the 1st nuclear test other than by the US. 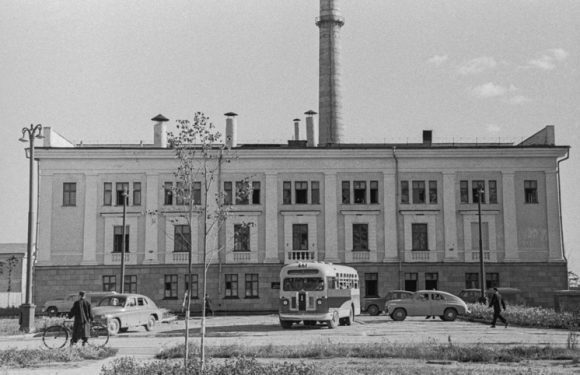 27 June 1954: World’s 1st nuclear power plant, AM-1 (aka APS-1), was commissioned and connected to the electrical grid, delivering power in Obninsk. AM-1 was designed under the leadership of N. A. Dollezhal. 22 November 1955: USSR’s 1st thermonuclear device (RDS-37, a two-stage device) was detonated at the Semipalatinsk test site. This also was the world’s 1stair-dropped thermonuclear device. 5 December 1957: USSR’s 1st nuclear-powered icebreaker, Lenin, was launched. This also was the world’s 1st nuclear-powered surface ship. 4 July 1958: USSR’s 1st nuclear-powered submarine, Project 627 SSN K-3, Leninskiy Komsomol, made its 1st underway on nuclear power. 1958: World’s 1st Tokamak, T-1, initial operation at Kurchatov Institute. I. V. Kurchatov served as the Institute’s director until his death in 1960 and was awarded Hero of Socialist Labor three times and Order of Lenin five times during his lifetime. After I. V. Kurchatov’s death in 1960, the noted academician Anatoly P. Aleksandrov was appointed as the director of the Institute and continued in that role until 1989. 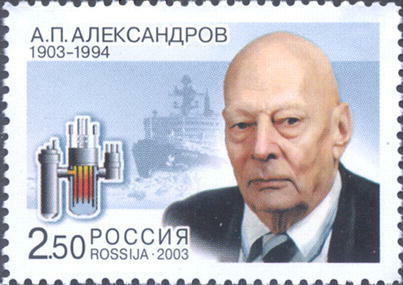 Aleksandrov already had a key role at the Institute, having been appointed by Stalin in September 1952 as the scientific supervisor for developing the USSR’s first nuclear-powered submarine and its nuclear power unit. Until 1991, the Soviet Ministry of Atomic Energy oversaw the administration of Kurchatov Institute. After the formation of the Russian Federation at the end of 1991, the Institute became a State Scientific Center reporting directly to the Russian Government. Today, the President of Kurchatov Institute is appointed by the Russian Prime Minister, based on recommendations from Rosatom (the Russian State Energy Corporation), which was formed in 2007. The evolution of Kurchatov Institute capabilities from its initial roles on the Soviet nuclear weapons program is shown in the following diagram. 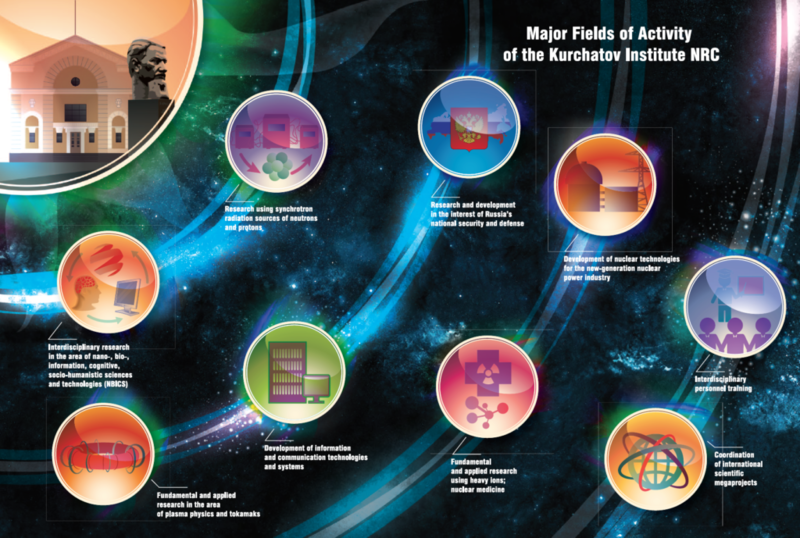 Modern roles for Kurchatov Institute are shown in the following graphic. 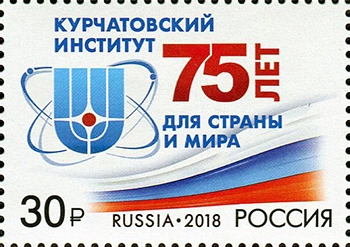 In the past 75 years, the Kurchatov Institute has performed many major roles in the Soviet / Russian nuclear industry and, with a national security focus, continues to be a driving force in that industry sector. The F-1 reactor designed by the Kurchatov Institute was a graphite-moderated, air-cooled, natural uranium fueled reactor with a spherical core about 19 feet (5.8 meters) in diameter. F-1 was the first reactor to be built and operated outside of the US. It was a bit more compact than the first US reactor, the Chicago Pile, CP-1, which had an ellipsoidal core with a maximum diameter of about 24.2 feet (7.4 meters) and a height of 19 feet (5.8 meters). F-1 was never refueled prior to its permanent shutdown in November 2016, after 70 years of operation. The first generation of Soviet plutonium production reactors were graphite-moderated, natural uranium fueled reactors designed under the leadership of N.A. Dollezhal while he was at the Institute of Chemical Machinery in Moscow. The Kurchatov Institute had a support role in the development of these reactors.The five early production reactors at Chelyabinsk-65 (later known as the Mayak Production Association) operated with a once-through primary cooling water system that discharged into open water ponds. Obninsk was the site of the world’s first nuclear power plant (NPP). This NPP had a single graphite-moderated, water-cooled reactor fueled with low-enriched uranium fuel. The reactor had a maximum power rating of 30 MWt. AM-1 was designed by N.A. Dollezhal and the Research and Development Institute of Power Engineering (RDIPE / NIKIET) in Moscow, as an evolution of an earlier Dollezhal design of a small graphite-moderated reactor for ship propulsion. The Kurchatov Institute had a support role in the development of AM-1. 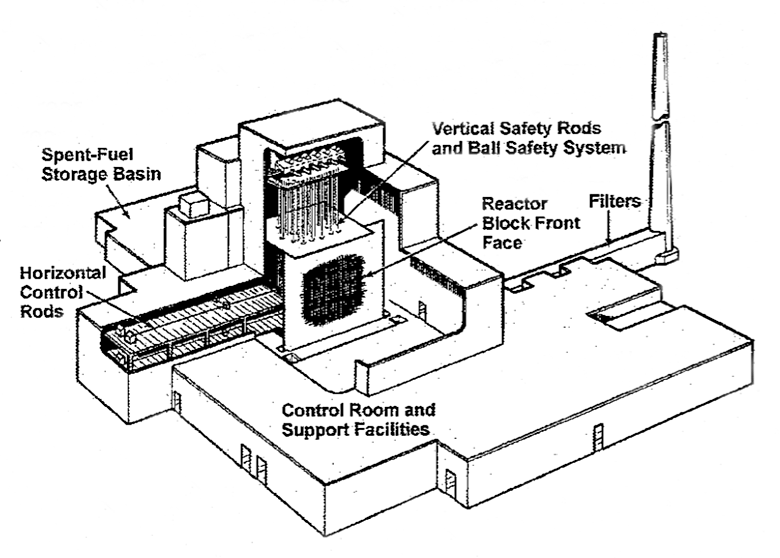 The basic AM-1 reactor layout is shown in the following diagram. The closed-loop primary cooling system delivered heat via steam generators to the secondary-side steam system, which drove a steam turbine generator that delivered 5 MWe (net) to the external power grid. 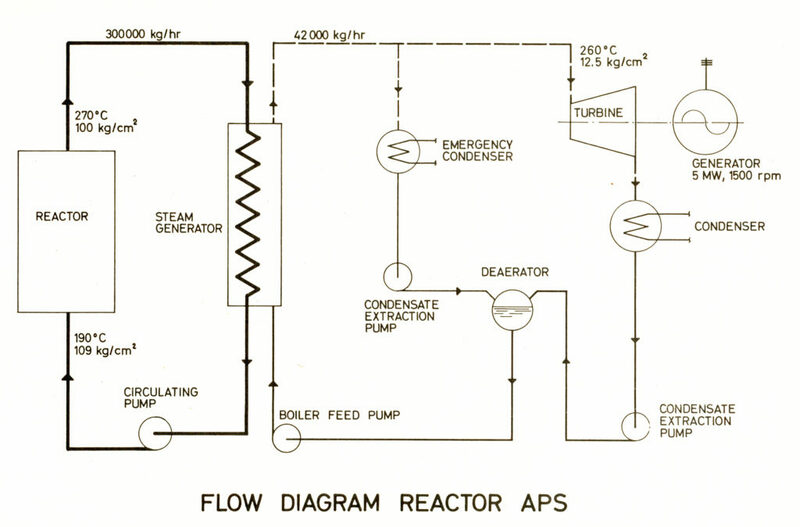 Following is a basic process flow diagram for the reactor cooling loops. In addition to its power generation role, AM-1 had 17 test loops installed in the reactor to support a variety of experimental studies. After 48 years of operation, AM-1 was permanently shutdown on 28 April 2002. The AM-1 nuclear power plant design was developed further by NIKIET into the much larger scale RBMK (Reaktor Bolshoy Moshchnosti Kanalnyy, “High Power Channel-type Reactor”) NPPs. The four reactors at the Chernobyl NPP were RBMK-1000 reactors. Research on plasma confinement is a toroidal magnetic field began in Russia in 1951, leading to the construction of the first experimental toroidal magnetic confinement system, known as a tokamak, at Kurchatov Institute. T-1 began operation in 1958. The basic tokamak design for magnetic plasma confinement has been widely implemented in many international fusion research machines, winning out over other magnetic confinement concepts, including the Stellarator machine championed in the US by Dr. Lyman Spitzer (see my 30 August 2017 post on Stellarators). Major international tokamak projects include the Joint European Torus (JET) at the Culham Center for Fusion Energy in Oxfordshire, UK, the Tokamak Fusion Test Reactor (TFTR) at Princeton Plasma Physics Laboratory in the US, the JT-60 at the Japan Atomic Energy Agency’s Naka Fusion Institute, and most recently the International Thermonuclear Experimental Reactor (ITER) being built now at the Saclay Nuclear Center in southern France. 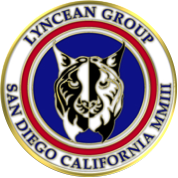 In 2015, I compiled the first edition of a resource document to support a presentation I made in August 2015 to The Lyncean Group of San Diego (www.lynceans.org) commemorating the 60thanniversary of the world’s first “underway on nuclear power” by USS Nautilus on 17 January 1955. That presentation to the Lyncean Group, “60 years of Marine Nuclear Power: 1955 –2015,” was my attempt to tell a complex story, starting from the early origins of the US Navy’s interest in marine nuclear propulsion in 1939, resetting the clock on 17 January 1955 with USS Nautilus’ historic first voyage, and then tracing the development and exploitation of marine nuclear power over the next 60 years in a remarkable variety of military and civilian vessels created by eight nations. Here’s a quick overview at worldwide marine nuclear in 2018. The original 2015 resource document and this updated set of documents were compiled from unclassified, open sources in the public domain. I acknowledge the great amount of work done by others who have published material in print or posted information on the internet pertaining to international marine nuclear propulsion programs, naval and civilian nuclear powered vessels, naval weapons systems, and other marine nuclear applications. My resource document contains a great deal of graphics from many sources. Throughout the document, I have identified the sources for these graphics. I hope you find this resource document informative, useful, and different from any other single document on this subject. Below is an outline to help you navigate through the document. 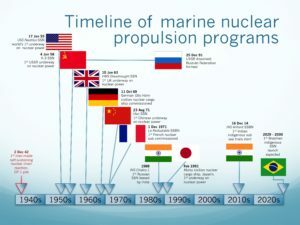 Outline of Marine Nuclear Power: 1939 – 2018. 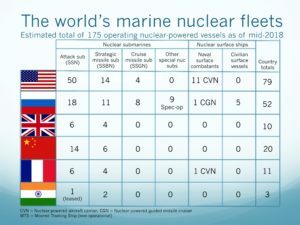 Russian current nuclear vessel fleet. Cruise missile submarines (SSG & SSGN).